There’s something unique about cubes that attracts people. Perhaps it’s the promise of playing with the “best” cards. Perhaps it’s the communal experience of playing with someone’s creation, or the opportunity to draft an unknown format. Whatever the attraction may be, I encourage everyone to give cube a try. I built my cube over this past Rosh Hashanah—I was out of town and had boundless free time when I wasn’t in synagogue. Creating, tweaking, and playing my cube was a great joy. My baby had a great run, but all times things must change, and last weekend I overhauled the entire thing. While I’m no master of cube design and theory (check out Andy Cooperfauss’ CubeCast and Jason Waddell’s articles for some expert advice), I have my own ideas and stories which I’d like to share. I wanted my cube to have themes that would distinguish it from other cubes and provide fun draft archetypes. Tokens was my first (and last) good idea. Tokens are easy to design around (include token-makers and cards that reward you for having them, like anthems, equipment, and synergistic effects). Tokens aren’t particularly parasitic (design lingo for mechanics like infect, which want to be in decks with many similar cards). 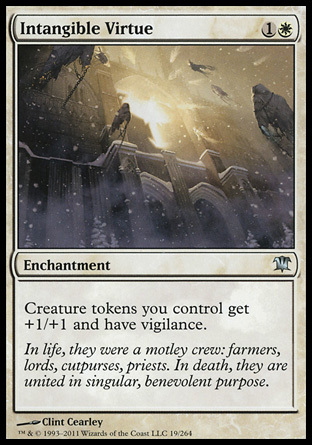 For example, token-makers like Spectral Procession are much more powerful in a dedicated token deck, but are still good in a non-token deck. I included a few parasitic cards, like Intangible Virtue, to reward the dedicated tokens player, but tried to mostly include cards (like the aforementioned anthems) that rewarded aggro but were particularly good in a tokens deck. In the cube’s inaugural draft, THE Kadar Brock demonstrated how powerful and flexible a token deck could be. In subsequent eight-person drafts, up to three people could be in tokens and still command powerful decks. 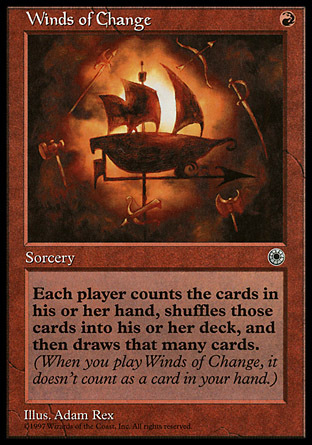 Tokens were a fun, powerful, and deep archetype. Sounds great, right? Lesson #1: Don’t overly support one archetype. Tokens were so powerful that they obliterated other archetypes. They beat every other aggro deck. Their anthems (which I’d included too many of) meant they’d out-attrition every opponent; trading a Goblin Guide for a 2/2 soldier token or a Hellrider for a quarter of a Lingering Souls was common and fatal for the non-token aggro decks. Consequently, non-token aggro was almost unplayable. Red was a much weaker color than intended because so many aggressive cards were horrible against (and only good in decks with) tokens. Control decks, too, had problems; wraths were mitigated by anthems and drain effects, and one-for-one removal like Doom Blade were atrocious at dealing with Lingering Souls and Spectral Procession. Control decks needed to be full of creatures with enters-the-battlefield abilities and wraths just to keep up. The end result of my initial tweaks was that control decks produced massive amounts of card advantage. Control decks could beat tokens, and the format was balanced, but polarized—you were either running tokens or a control deck (with few exceptions). Lesson #2: Beware the ripples. As I recognized the warping caused by tokens, I removed a few of the more egregious offenders, like anthems, and put in more hate cards, like wraths. I intended to make non-token aggro decks more viable against tokens, and I succeeded; token decks were no longer as dominant and non-token aggro decks could beat token decks. Great, right? Nope! I didn’t appreciate how strong control decks had become in order to combat tokens. There were too many Skinrenders, Corrupted Consciences, and Lavalanches. Card advantage and mana-fixing were out of control. 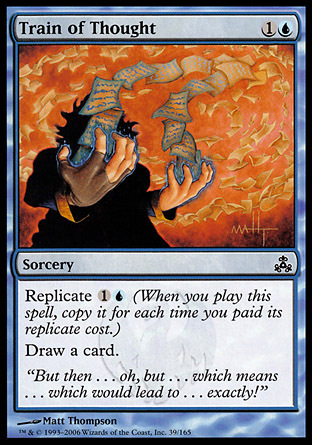 Sure, all color combinations were viable—Esper control, Jund ramp-control, UG ramp-control, Grixis control, Bant aggro-control, WB token-control, UB control, and WG token-ramp-control were all viable archetypes—but they were all control decks. Now, instead of my cube being a format of token decks versus control decks, it was a one-archetype format. While my intention had been to strengthen aggro by weakening its enemy, I had only neutered control’s only predator. Lesson #3 Keep tweaking, keep erring, keep learning. I’m trying several new things with my new cube. I’m not pushing any one archetype as hard. 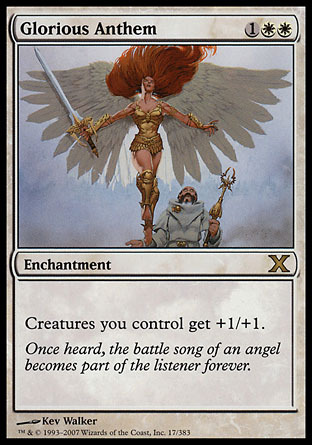 Tokens remains as a sub-theme, but lack parasitic cards like Intangible Virtue and Gaea’s Anthem. Control has fewer creatures with ETB effects and wraths. I’m including other sub-themes, like tribal and combo kills. Hopefully, these changes will make for a new and fun experience for all my fellow players. The important thing to keep in mind is that a cube is a living thing—made out of inert cardboard cards and plastic sleeves, but a living thing nonetheless. Cubes are not meant to stay in one form forever but should shift to continue providing new experiences and challenges. My search is not for “the perfect cube” but for “more cube fun.” Perhaps I’ll keep this iteration around for a year with only minor tweaks, perhaps I’ll break it up and return it to its original configuration. Or maybe I’ll make an entirely new cube with completely different archetypes and themes. Who knows? The fun is in playing cube and in growing as a player and as a cube designer. Cube design (and life, for that matter) is an exercise in collaboration, and I wouldn’t know a fraction as much as I do if it weren’t for all my friends’ opinions, reactions, and playtesting. I invite you all to play cube, to design your own, and/or to share your comments, thoughts, and feelings in the comments below. As always, thanks for reading. Looking forward to testing out your new configuration!